A questioner asked Marshall how long he thought it would be before segregation in education was eliminated. He replied that it might take 'up to five years' for the entire United States. And he predicted that by 1963, the 100th anniversary of the Emancipation Proclamation, segregation in all of its forms would have been eliminated. 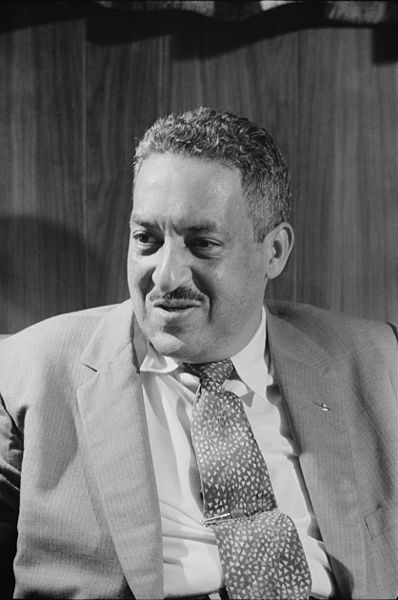 -- Our colleague John Q. Barrett, Professor of Law at St. John's University in New York City, relating a comment made by future Justice Thurgood Marshall (right), then lead attorney for the NAACP Legal Defense Fund, at a press conference immediately after the U.S. Supreme Court declared de jure segregation of public schools unconstitutional. Today's the 57th anniversary of the Brown v. Board of Education judgment. The dispatch excerpted above is the latest in an informative series that John, who's writing the biography of Robert H. Jackson (prior posts), former Supreme Court Justice and Chief U.S. Prosecutor for the post-World War II Trial of the Major War Criminals at Nuremberg, Germany. John welcomes subscribers to his Jackson List; e-mail him at barrettj@stjohns.edu.